Spin Casino is a cornerstone member of the Palace Group, was established in 2001 and is owned and operated by Bayton Limited. 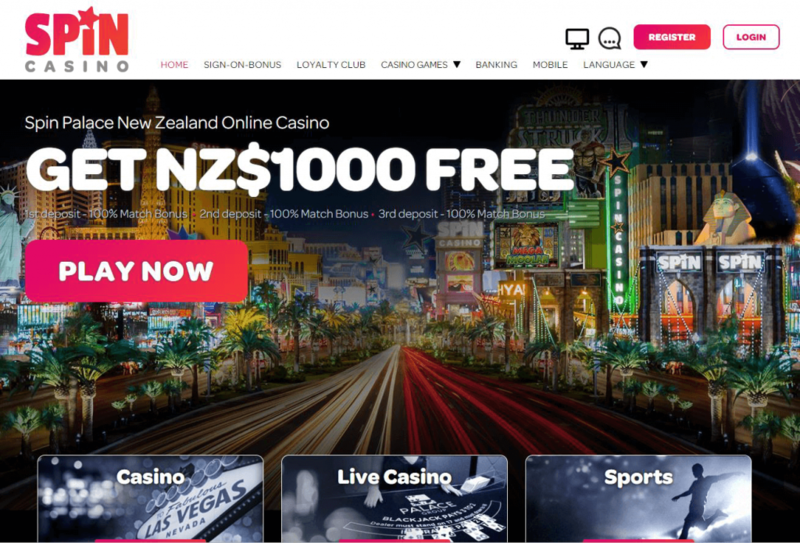 It’s been a popular online casino in New Zealand for a while, which is why we here at CasinosOnline.net.nz knew we had to review it for you. Like most of the New Zealand sites that we showcase for you here, this one allows you to play most games for free as well as for real money. This gives you a chance to really try the casino out and make sure you’re happy with it before you place any real money bets or commit yourself to membership. Take some time to read through our review below, and if the casino seems like a good fit for you, try it out in the free money mode. If you feel satisfied after that, you’ll be ready to put down some of your coffers. This particular casino is well supported and has good foundations, which is what make the superb playing experiences that you’ll enjoy here possible. The award-winning Microgaming software is the power behind it, so you can expect the smooth functionality, immersive games and incredible graphics and sounds that sophisticated New Zealand players deserve whenever you visit. The reliable Microgaming software also means that you can access the casino in a few different ways, and it will always run smoothly. No matter what device or operating system you’re using, whether Windows, Apple, Android or anything else, and whether a desktop or mobile device, you’ll experience some of the best gameplay available to New Zealanders. The software also runs equally smoothly as a download or a Flash player version that is accessed through your browser. You can also access several transaction and customer support channels easily, so whatever works best for you is possible here too. Trusted banking options include Visa, iDebit, EcoPayz and MasterCard, and you can liaise with trained Customer Service Agents via email, telephone and live chat. The Malta Gaming Authority strictly regulates and licenses Spin Casino, and ensures that all of these high standards are upheld. The casino also bears the prestigious independent seal of approval for safety and fairness from eCOGRA, meaning you can really trust that you’re in safe hands. Relax and enjoy your gameplay, or focus all your concentration on maximising your winnings rather than worrying about background factors. You’ll have over 400 games at your fingertips when you visit Spin Casino, include top-drawer versions of Craps, Keno, Baccarat, Roulette and Scratchcards, so you’ll need to be able to focus on them properly. The free play mode mentioned above can also be used to practice and polish your skills and strategy, until you feel ready and confident to place real money bets. When you are ready to play for real money, you’ll enjoy fabulous bonuses that will allow you to bet more and then win more. Like the other casinos we showcase here at CasinosOnline.net.nz, these are used here to tempt new players to the palace and to keep loyal members from leaving. Payout ratios routinely go as high as 97%, and the Welcome and other casino bonuses as well as the VIP and Loyalty programmes ensure that you are always looked after in the manner to which you should be accustomed. We couldn’t recommend an online NZ casino over Spin Casino, and once you’ve seen it for yourself we’re sure you’ll agree. Visit today!